As a life-long student of the social sciences, I’ve always been intrigued by the capacity of seemingly honest, intelligent people to twist facts and re-tell events in the cause of resolving their own cognitive dissonance and advancing what they perceive to be the best interests of their tribe. The current Presidential campaign in the United States is a case and point: Republicans and Democrats are both quite sure that the other side, is at best, embellishing or editing the truth in the cause of winning supporters. At worst, there’s an incredible amount of intentional lying going on. Why? Heres my explanation. All of us belong to a number of tribes. I am convinced that tribal loyalties not only shape our opinions but empower us to comfortably revise inconvenient truths. I respectfully invite you to take the following brief test. Without knowing who you are or what your current opinions are I feel confident that I can predict your political preferences from the answers you give. Race: White-European, African-American, Native American, Latino, Asian, etc. Current national allegiance: America, Mexico, Canada, France, Italy,…..etc. Ethnicity: Is there a particular country, or cultural heritage that you and your family identify with? Humanity: Do you identify yourself as a member of the world-wide community of human beings? Add whatever groups or tribes you want. Make your list as long as necessary. II. If you are not an atheist, would you say that your religious beliefs inform or dictate your opinions on controversial political and social issues of the day? I respectfully suggest that if you did not include the “community of human beings” as being one of the 4 most important groups you identify with, you are more than likely a worthy of the label, tribalist. If your response to question #2 indicates that your religion determines you opinions on social and political issues, you are most definitely a tribalist. What is a tribalist? A tribalist is someone whose loyalties and reasoning must always advance the particular interests of their tribe, regardless of the implications or consequences to other tribes. Like the pessimist who always sees the glass as half empty, a die-hard tribalist is not free to see the whole story. A tribalist approaches reality with an inherent bias that shapes how they perceive others, facts and history in the service of affirming, validating and advancing the interests of their tribe. A emotional equilibrium of a tribalist is in large measure determined by how their tribe is viewed, accepted and validated by the rest of humanity. Tribalists tend to be politically and socially conservative by default: they cannot concern themselves with the interests of all because by default, they are only concerned about the interests of their tribe. A tribalist is more apt to assume that when members of tribe ‘B’ threaten any members of tribe ‘A’, ALL members of the tribe ‘b’ must share the animus and intentions of aggressor. E.G. Many if not most Americans assume since 9/11 that all Muslims are intent on killing Americans and destroying our country. 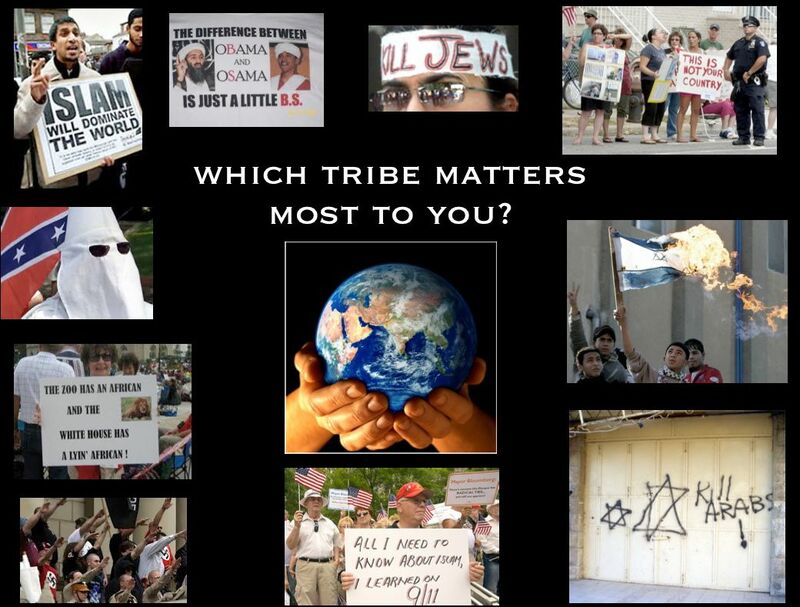 Not only don’t tribalists not like or trust members of tribes they believe are a threat to their own, but they don’t trust anyone who shows any respect or tolerance for tribe ‘b.’ E.G. Civil rights workers in the 1960’s were called n*gger lovers; progressives concerned about the welfare of people in need are socialists; Jewish people concerned about the interests of the Palestinian people are traitors and/or self-hating Jews. Obviously, if your religion is defining and enunciating the absolute truths that you subscribe to, you more than likely do not concern yourself with how those tribal-interests or religious truths may negatively impact others. For example, the Catholic Church and a number of conservative Protestant denominations abortion is murder. If you accept that dogma, you probably don’t care that millions of people don’t share that point of you. Abortion is murder and murder is morally reprehensible. If you are rigidly insular Orthodox Jew who believes in the exclusivity of the relationship between God and the Jewish people, you more than likely believe that all parts of West Bank are part of the sacred lands God promised to the Jewish people in the Torah and you have little or no concern for the plight of Palestinian people. In fact, people who show any interest in or respect for Palestinians must be supportive of all Palestinian terrorist acts and support the destruction of the State of Israel. People who included the world-wide community of human beings in their top 4 tribal affiliations, will consistently take into account how the interests of their primary tribe coincides or conflicts with the interests of other groups. Such people are called humanists. Is it any wonder that the more education a person has, the more likely he or she is to be a humanist and not a tribalist? Progressive religious denominations and liberal political movements are the by-product of people who may in fact have passionate tribal loyalties but who cannot and will not allow their the self-interests of their tribes to be promoted at the expense of others. In profiling people, a humanist will always take into account that regardless of another persons tribal affiliations, that person is their equal. Every time I hear a birther question the pedigree of Barack Obama, I hear a person who puts his/her tribal loyalties to white, conservative, Christian America first. After all, that black man in the WHITE House can’t possibly be legitimate! He’s the wrong color and has a Muslim sounding name. In explaining why Colin Powell endorsed President Obama, Republican John Sununu invoked his own criteria for understanding others when he suggested the endorsement was based exclusively on race. Every time I hear a fellow Jew rail against how President Obama hates Israel, I hear someone frightened by the idea that a humanist in the White House who doesn’t hate all Muslims and Arabs as much as he or she does cannot possibly be trustworthy. The fact that this President has done more for Israel than any of his predecessors must be ignored by Jewish/White/Israel first tribalists who can’t consciously entertain the possibility that Barack Hussein Obama is really a mensch, a good guy. Who is going to vote for Romney on Election Day: Tribalists who are more loyal to their race, faith and nationality. If you are not a tribalist and you are going to vote for Romney, you are more than likely a member of one of the most untrustworthy, unreliable, nefarious tribes of all: greedy people who are only concerned about the acquisition of wealth and have little or no interest in the concerns of humanity. Who is going to vote for Obama on Election Day: people with many diverse tribal loyalties who don’t have illusions about their respective tribes being better or more “right” about the truth than anyone else. Obama supporters are people who respect and celebrate diversity, but recognize that the most important tribe we ultimately belong to is the family of human beings. Next Next post: Is It Any Wonder Republicans Don’t Believe in Evolution? Reblogged this on Demokrasi Kesukuan.